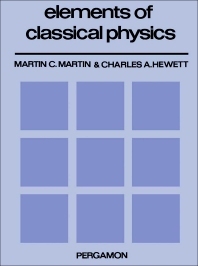 Elements of Classical Physics tackles the different areas of general physics in a way that the authors believe to be more effective. The book contains material easily understood with a minimal mathematical framework and introduces the necessary mathematical concepts when they have been presented in a typical concurrent mathematical course. The book also provides a quantitative understanding of the different concepts in a wide variety of specific situations. The topics covered, which are arranged according to increasing difficulty in a uniformly progressive pace, are temperature and heat; light and wavelength; particle motion on and special relativity; dynamics, laws of motion, momentum, work, and mechanical energy; electromagnetism; and thermodynamics. The material is recommended as a textbook for beginning physics students, as it aims to give its readers a smooth transition from high school to a college level of understanding on the subject.